I liberated a couple of calendula plants from a pile of builder’s rubble in the springtime. I planted them in one of our soft fruit beds, intending to save some seed and plant amongst the veggies to confuse the pests with their bright flowers. They’ve done so well that I’ve got flowers aplenty. The petals make a lovely addition to salads, but there are only so many you can eat so I looked at alternative uses for them. This is a frugal and eco friendly hand scrub which substitutes well for that Swarfega with the scrubby bits in. It’s easy to make and cost us pennies (for the salt). To make a hand scrub you need to start by drying some petals. A couple of handfuls of the dried petals is probably sufficient, but they shrink in drying so you need to start out with a fair pile. Once dry, you need to use some to make a calendula infused oil. Easy peasy. Stick a handful of your dried petals in a jar and cover with oil. Olive oil in our case, as we produce our own we’ve gallons of the stuff, but any vegetable based oil will do. Leave in a dark cool place for a couple of weeks and then sieve out the petals. Choose a jar which you can stick your hand into for your hand scrub. I’ve got some fabulous wide necked ones which fasten with metal clips. Put a couple of inches of rough sea salt in your jar, then a handful of dried calendula petals. Top the lot off with your calendula infused oil and give it a good shake. To use, simply grab a dollop as required, scrub well then rinse off. It leaves your hands clean and the soothing calendula and moisturising olive oil leave your hands in better shape than soap will. For variety and different scents and properties try using different flowers and herbs. Rose petals are nice, but choose your roses carefully as many are disappointing in terms of scent. Rosemary is another which works well. You can also use the calendula oil that you’ve produced to make a salve for small grazes and skin irritations by heating the oil gently with some beeswax then allowing to cool. It makes a nice lip balm if you’ve any little pots. Do I sense a Christmas pressie idea forming? 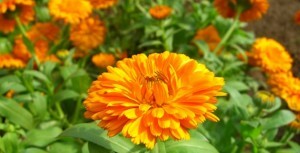 Thankyou www.flowerspictures.org for the calendula photos. Hundreds of flower pictures, perfect for those who forget to recharge their camera batteries (or just need cheering up)!